I'm giving away a PAIR of tickets to the Canadian premiere of SPINNING PLATES on Wednesday, December 4th at 7pm held at the TIFF Bell Lightbox. 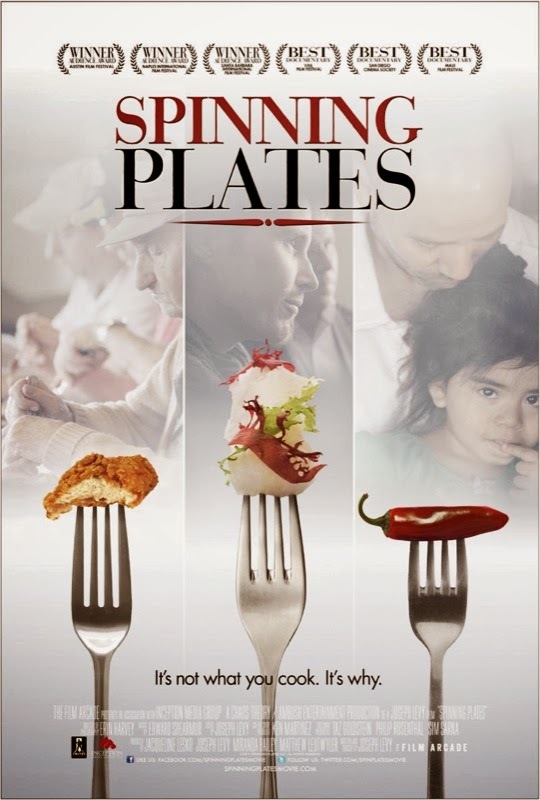 Joseph Levy's Spinning Plates is a feature documentary about three extraordinary yet wildly different restaurants: Alinea, Breitbach’s Country Dining, La Cocina de Gabby and the compelling stories of the incredible people who bring these restaurants to life. A world-renowned chef competes for the ultimate restaurant prize in Chicago, while privately battling a life-threatening condition. A 150-year-old restaurant in Iowa is still standing only because of an unbreakable bond with the community. And a fledgling Mexican restaurant in Tucson struggles as its owners risk everything to survive and provide for their young daughter. Their unforgettable stories of family, legacy, passion and survival come together to reveal how meaningful food can be, and the power it has to connect us to one another. Contest starts on Monday, November 25th and ends on Monday, December 2nd at 12PM. One lucky winner will be drawn randomly from www.random.org. I will announce the winner on Monday, December 2nd.